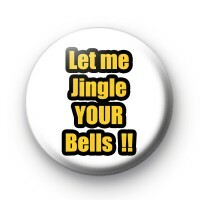 Let Me Jingle Your Bells Badge slogan badge in white with black and yellow text which reads let me jingle your bells. A cheeky and naughty Xmas badge, perfect to wear to the office party or pinned to your work clothes during the festive period. We have a huge range of Xmas badges available so be sure to browse our Christmas badge category. Our Christmas badges make perfect little stocking fillers. Standard 25mm badge made by hand in the UK.